George Thom's father was William Thom (born in Marnoch, Banffshire about 1813) who was a farmer employing 5 men and a boy to farm 128 acres. His mother was Mary Thom (born Auchterless, Aberdeenshire about 1817). He was one of a big family having siblings Margaret (born about 1836), Alexander (born about 1839), James (born about 1841), Jessie (born about 1845), Robert (born about 1847) and Peter (born about 1850). George Thom attended the University of Aberdeen and was awarded an M.A. in 1863. He was appointed Principal of Doveton College in Madras, India, in 1867. The College had been opened on 1 March 1855 at Vepery, within the city of Madras. Captain John Doveton, who rose to Captain Commandant in the Seventh Regiment of Infantry, had bequeathed £50,000 for the education of the community. After his death in October 1853 half the money was used to set up Doveton Protestant College in Madras, the other half being used to set up the Parental Academy at Calcutta. Thom was Principal of the Doveton Protestant College until 1876 when he returned to Scotland. He then became Vice-Principal of Chanonry School, Aberdeen. Captain John McNabb, who made his fortune as a ship owner, died in 1802. He left £60,000 to set up a "school for the poor of the parish of Dollar". The Rev. Andrew Mylne, however, wanted to use the money to create an Academy to educate boys and girls from Dollar and the surrounding district. He engaged a leading architect, William Playfair, who designed a fine school building and houses to accommodate teachers and boarders. John McNabb's School or Dollar Institution opened in 1818. In 1868 a hall was added. Thom was appointed Principal of Dollar Institution in 1878 [today the school is called Dollar Academy], holding this position until he retired in 1902. The Trustees' Minutes for 1878 indicate that the new Principal was to take charge of Mathematics and Natural Science and of the short leet of three (Thom, Aberdeen; Kinmond, Dollar; Gall, Lucknow) Thom was offered the job mainly because he had most recently taught (and was teaching) Botany. Thom became the first non-clerical Principal, and possible the first to be termed Rector. He himself was nicknamed 'Tim' or 'Caractacus' and his wife was known as 'Wahoo'. We give a few details of how the school developed during Thom's period as Principal. Under the provision of the Endowed School Act, pupils under the age of ten were removed from the Academy in 1887. The Infant School was handed over and ground provided for the Board School at the Cairpark corner. A new Board of Trustees appointed by the Government turned the gardens of Dollar Institution into playing fields; the first school badge was designed by the Governors and the inscription was added to the pediment. The 'temporary' technical building was created, a gymnasium was added which opened in 1893, the first school flag was designed, and the first school magazine appeared between 1881 and 1883. 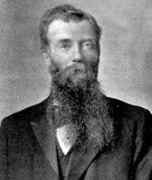 The Edinburgh Mathematical Society was founded in 1883 and Thom was one of the founder members, joining the Society at its first meeting in February of that year. He took an active role in the running of the new Society and he was honoured by being elected President of the Society for session 1886-87, having already served the Society in the role of Vice-President. The University of St Andrews conferred an honour on Thom during his time as President of the Edinburgh Mathematical Society. At a meeting of the Senatus Academicus held on Saturday 11 February 1887 it was agreed to confer the degree of Doctor of Laws on George Thom, M.A. Principal of Dollar Institution, president of the Edinburgh Mathematical Society. Another member of the Society, John Sturgeon Mackay, M.A., mathematical master Edinburgh Academy, was also offered an LL.D. by the University of St Andrews at the same meeting of the Senate. The gentleman whose portrait appears in this, the first, number of The Dollar Magazine, has been a prominent figure in Dollar for nearly twenty-five years, and his appearance must be familiar to most of our readers. The period of Dr Thom's Headmastership has covered a very important era in the history of Dollar Academy, and of secondary education in Scotland, namely, that following upon the action of The Endowed Schools Commission, restricting the application of school endowments to secondary education. After considerable delay, a scheme for the administration of the M'Nab Endowment was passed through Parliament in 1888, and came into operation shortly thereafter. This entailed an entire remodelling of the internal management and arrangement of the Academy. What had been the primary section, or "Lower School," including the Infant and Sheardale Schools, was handed over to the School Board, and the whole of the Academy building was thus made available for secondary teaching. Through the representation of one interested in the well-being of the school, the scheme authorised an expenditure up to £2,000 on such alterations and equipments as might be required to bring the Academy up to the modern standard of secondary schools. This was done in the most thorough and efficient manner under the advice and supervision of Dr Thom, with the result that Dollar Academy will now bear comparison with any school of its kind in Scotland. The laboratories for science teaching are fully equipped, and the gymnasium is one of the finest to be seen in any school. Primarily through the exertions of Dr Thorn and mainly by contributions from F.P. 's, an excellent workshop, with all appliances, including turning lathes for wood and iron, driven by a powerful oil engine, has been added, and is largely taken advantage of by the pupils. Music (piano, violin, etc.) also has been added to the curriculum as an extra, and for a number of years not only paid its way, but was a source of revenue. Along with all this, the arrangement of the classes, and the course of instruction had to be entirely reconstructed in accordance with the scheme, and with the requirements of the Education Department. It is not too much to say that the school as it stands-which is immensely in advance of what it was fifteen years ago-has been formed entirely under Dr Thom's management, and its efficiency and completeness are a standing monument to his thorough up-to-date knowledge of educational matters. During the period referred to there has been great activity throughout the country in the matter of secondary education, and many schools, and secondary departments in Board Schools, have arisen, especially in large towns. to meet the demand. As a natural consequence, the numbers attending provincial schools have diminished everywhere, in some old established schools, to the extent of fifty per cent. It is greatly to the credit of Dollar Academy and its management, that it has suffered in this way much less than almost any other school in a like position. The numbers of pupils fluctuate considerably from year to year, so that it is difficult to know exactly how we stand, but it is a coincidence worth noting, that three years ago the enrolment was exactly the same (405) as it was in the upper school in 1878 and 1879, the year Dr Thom came. There was a drop the following year, but last year and this, the tendency is again upwards. While giving a hearty welcome to the new Headmaster, we offer our sincere congratulations to his predecessor, Dr Thom, on his honourable retirement, after twenty-four years of faithful service in that trying and responsible position. On the closing day of last session Dr Thom was presented with a handsome piece of silver plate bearing the following inscription: "Presented to Dr Thom by his pupils, as a mark of affectionate regard. Dollar, 24th June 1902." [Descendants of the family still have this plate.] A testimonial on a larger scale, embracing former pupils and all well-wishers, is also being promoted, and will, we trust, be heartily subscribed to. Dr Thom and his family have elected to remain in Dollar, and to carry on part of the work in which they have long been so successful - the charge and tutoring of young gentlemen attending the Academy. The knowledge gained by long experience of the working of the school will, we doubt not, be at the service of his successor, and cannot fail to be of value.